It’s not often that an exercise is as cool-looking as it is effective, but club training is changing the game. Clubs, of course, are traditionally mêlée weapons (read: used for bashing heads in), and the only reason people used to train with them was to improve their feats in battle. It wasn’t until relatively recently that trainers and physical therapists learned that they’re incredible tools for improving performance and recovery for strength athletes. Training focuses heavily on different kinds of swings, and at first glance, you might think a club is just a needlessly elaborate kettlebell. But the long lever, unbalanced weight, and multiple planes of motion mean that clubs offer a lot of benefits you can’t get anywhere else. There are three kinds that are typically used by athletes, each with their own particular benefits. Take a look at the info below to find out the best ways to implement them in your own training. Originally a conditioning tool for wrestlers in ancient Persia, these clubs were popular among Indian wrestlers in the 18th century, when they made their way to England and became a central piece of the country’s Victorian-era health craze. At one to two pounds and about eighteen inches long, Indian clubs are the lightest of the three, which makes them terrific tools for warm ups and for strengthening the stabilizer muscles of the rotator cuff, which respond best to high repetitions. Here’s Cotter’s ideal warmup for any kind of OHP workout. Sometimes called heavy clubs or steel clubs, club bells can weigh up to forty-five pounds and are terrific tools for building strength and endurance, particularly in the grip, forearms, and core. Also called the gada, the mace is another favorite of pehlwani, or Indian wrestlers. Maces aren’t too heavy (they typically weigh between ten and twenty pounds), but the real challenge for the athlete comes from its length: maces are about 4 feet long. A lot of exercises swing the mace behind the head, which makes it a great for working the scapula, upper back, midline, and other muscles involved with posture. Cotter is also quick to emphasize that both maces and club bells improve rotational torque and strength in multiple planes of motion, two qualities that the traditional barbell jockey often lacks. Interested in joining the club? (Get it?) Onnit has an impressive variety of Indian clubs, club bells, and maces you can choose from, or if you’d like to save a little time and money, you can try the adjustable clubs and maces from Adex. Keep swinging! Featured image courtesy of @antoniodisidoro. Providing totally wrong information.. Mainly trying to sell the so called clubbell, which is just like Indian club but heavier(because it is made of steel).. Soon these guys would start telling they are the inventors of the whole club training.. which they have done with many other training strategies and equipments borrowed from east. 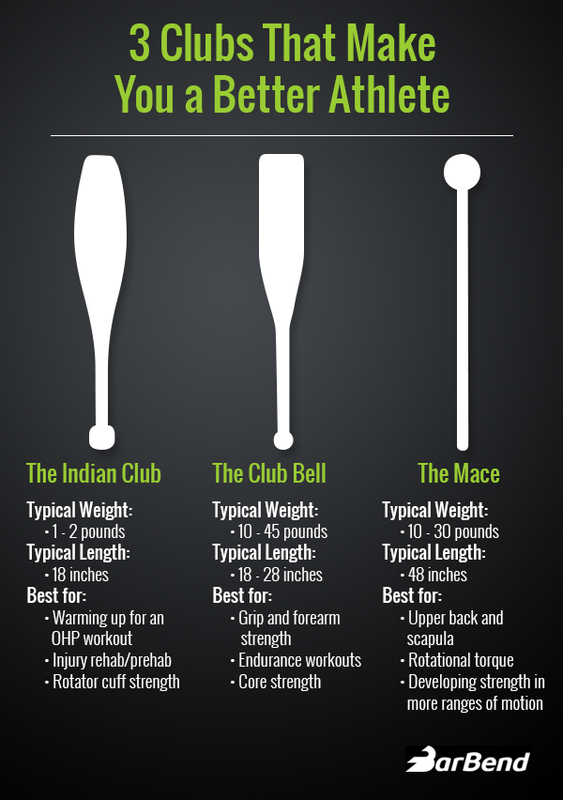 Let me tell you Indian clubs are not for warm-up purpose only.. they can go upto nearly 100kgs.. I personally have seen such big heavy clubs and same is the case with the mace which is called gada in india and can go upto as much weight as you can improve to.. there is no limit.